If you’re looking for Mooloolaba event accommodation this is it. Whatever reason you are coming to Mooloolaba, whether it’s on business, to run a race, attend an event then Breeze Apartments are the ideal accommodation for you, your colleagues, team members or family. It’s simply an event in itself. It is not every day that you experience Sunshine Coast accommodation like this. The uniquely curvaceous character of the balconies is only what you can see from the outside. This architectural beauty of this apartment building alone is worth the price of admission. 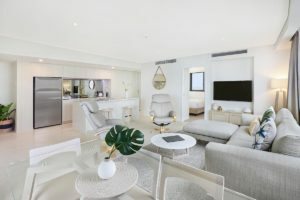 Designed for maximum sunshine and light, the curved balcony floors and full height windows uniquely frames the views of the beaches, bays and coves of the Sunshine Coast. The bold use of materials, lots of real wood veneer, travertine style tiles and generous use of hard wearing lacquer surfaces in the apartment provide an understated luxury uncommon with holiday accommodation. The fully equipped chefs kitchens means meal preparations are more like a pleasure not a chore. But if you prefer, there’s plenty choice with of restaurants and cafes on the Mooloolaba Esplanade. Check out the Alex Surf Club for a casual bite to eat. 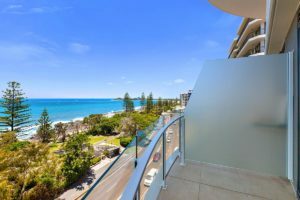 If you’ve bought the kids and they are skaters, there is a well developed skate park — floodlit for fun that goes into the night.Choose from 1, 2 or 3 bedroom apartments in this Mooloolaba apartment resort. You’ll feel more at ease here than at a hotel. If you’re here with team mates or colleagues, staying at Breeze make a lot of sense. 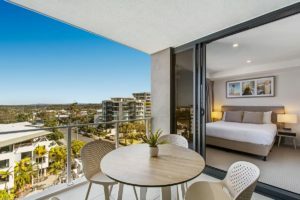 TheseMooloolaba apartments include all the facilities and amenities you’d expect with are all fully self-contained with cable television, laundry facilities, abundant free internet access, air conditioning and north-facing balconies with the most breathtaking views. All this and great resort facilities such as a heated swimming pool, BBQ area and outdoor spa, it’s a win all round regardless of results. Our five star Mooloolaba event accommodation with it’s unbeatable central location is a natural choice. Breeze Mooloolaba. Book now.